In my last post, I mentioned that I’m reading “The Art of Happiness: A Handbook for Living” by His Holiness The Dalai Lama and Psychiatrist Howard C. Cutler. Although I don’t usually write book reviews, I’ve made an exception in this case and I’ve been so inspired by this book that I couldn’t wait to finish the book to share my glee. I’m only halfway through and I definitely can’t put it down (except to update the blog and touch base with the family). I strongly recommend you do whatever it takes to read this book and to read it slowly and carefully. I read such books with my pen and write notes to myself and underline text and use the book as a notebook. For me, I guage how good a book is by how much ink I’ve scribbled all over the pages. So, on this basis, this book is doing brilliantly. Before I read the book, I must admit that I was a little uneasy getting too engrossed in a different religion. Although I’m a Christian, I do read very broadly but at the same time I wondered whether reading this book and absorbing the thoughts of the Dalai Lama was going too far. That I was crossing over into foreign soil and that when it came understanding happiness, I should turn to my Bible first. However, while they certainly address Buddist beliefs, the book has been written as a series of life-lessons for a Western, largely American, audience and it doesn’t delve into the spiritual in an overbearing way at all. Indeed, in many ways it reminded me of Kahlil Gibran’s “The Prophet” and “Tuesdays With Morrie”. “In The Art of Happiness: A Handbook for Living, the Dalai Lama offers a good first step when pursuing any positive goal: Learning. 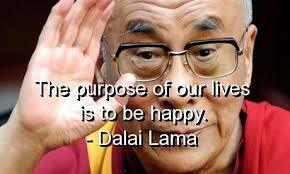 If our objective is happiness, we need to begin by learning about the benefits of happiness. The recent scientific evidence has identified a wide array of practical benefits of happiness extending far beyond merely feeling good–including better physical and mental health, longer life, stronger relationships, greater career success, higher income, and many other personal rewards. One of the fundamental principles of The Art of Happiness is that cultivating greater happiness not only benefits oneself but also one’s family, community, and society. There is new scientific evidence supporting this principle as well. Such evidence helps dispel our common cultural biases and myths, such as perceiving happiness as a somewhat “soft” or frivolous subject, or considering the pursuit of happiness to be self-centered or self-indulgent”2. This book is also about so much more than happiness. It also looks at sorrow and has a whole chapter about compassion, including a meditation exercise. Being part of 1000 Voices for Compassion (http://1000voicesspeak.org/), I really appreciated that chapter. It added quite a lot to my understanding. The book is also very helpful for writers interested in personality, what makes people tick and how to create really complex, more diverse characters. There’s quite a lot of discussion about what makes people tick…or indeed, not tick. After all, this is more of a book about people than just happiness itself. I’d also like to add that the Dalai Lama doesn’t pretend to be able to solve everybody’s problems and acknowledges there are people facing very complex problems. He doesn’t pretend to be able to fix these any better than anybody else. However, he does offer a few tools, which might help. When you consider that one of these tools might say alter your path by 10 degrees and perhaps another by a further 10, you are now 20 degrees away from where you were originally heading. Perhaps, this place is no different to where you were but it could be. There’s that hope. I often think that making these seemingly small changes can make quite significant difference over time. I must admit that while this book is a new to me, it did spend 97 weeks on The New York Times bestsellers list so obviously thousands, maybe even millions have beaten me to it and that could well include you. Have you read it? In which case, I would love to hear your thoughts and how it might have impacted on you. 3. His Holiness The Dalai Lama and Psychiatrist Howard C. Cutler: “The Art of Happiness: A Handbook for Living”, Hachette Australia, 2003. This entry was posted in Proust Questionnaire and tagged books, character, compassion, Dalai Lama, growth, happiness, love, meditation, philosophy, psychiatry, psychology, religion, spirituality, writing on August 31, 2015 by Rowena. I haven’t read it, but I have read the two works it reminds you of, so I imagine you are right. I hope you are felling better, and if not do soon. I have myself been in bed using up boxes of tishuses so you have my total sympathy. 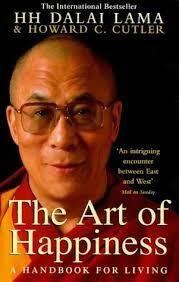 Although I have not read the art of happiness, I have come across many of the ideas through other sourses. Namely the national geographic, which did an issue on the deli lama, and documentaries. Nevertheless I shall put it on my reading list after your positive review. My current personal philosophy about happiness is that it cannot be reached externally by attainments or achievements, while they can bring joy and elation. As you mentioned about publishing a book in an earlier post. However happiness is internal being a state of mind and way of looking at things. So you can have happiness as long as you have the energy to put your mind in the right place. It is pleasure reading your blog, and though I’m sure you don’t need to be told, keep writing! Thanks so much Ferran. My need to write is like your need to play the violin. I put in hour after hour and I’m quite the philosopher, as if you hadn’t noticed and I really love probing and exploring ideas and the nature of people. I am agreeing with you about the source of happiness and what you say about it being a state of mind and a way of seeing things. Fortunately, my outlook has much improved over the last few years through all my extreme ups and downs with my health. In this time, other random people have died and I’m still standing and after awhile of this, I am appreciating just how lucky I am and really enjoying the good times. I hope you are feeling better and have re-emerged from your den of tissues. I’m on very strong antibiotics and the nebuliser and making myself squeezed orange juice and doing the natural thing too to speed things up. I need to be particularly careful as I have fibrosis in my lungs. Did you see my message on FB that Amelia has been offering an audition for the Sound of Music in Sydney for the role of Marta? At this stage, she just meets their on paper requirements and looks like Marta I suspect. She still has the vocal nodules although they have improved quite a lot. She was insistent on doing this and who was I to be the voice of reason? Its going to be an experience if nothing else and a bonding time for us provided I’m well enough to go. We’re looking at staying in Sydney the night before.